A red-green rod magnet made of AlNiCo works well for school lessons and experiments. This strong rod magnet is ideal for science projects or class demonstrations. It is made from an alloy of Aluminum, Nickel and Cobalt (AlNiCo) and it is extremely durable. It produces a very strong magnetic field. Rod magnets have a thickness which is equal to or larger than their diameter. 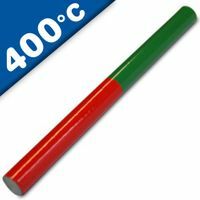 Buy Alnico Red-Green Rod Magnet at Magnosphere and get a better deal!